Many professional airplane model kits, geared toward children and adults, are available in plastic, wood, steel and high-tech metals. These models are nice for display pieces but may lack originality and the ability to spark your child's imagination and creativity. Children can become innovators by crafting their own model airplanes out of simple materials such as paper, cardboard and aluminum cans. With a few soda cans and supplies, your child can make a fun model airplane. Punch a small hole 1/2 inch from the top of one soda can using the pointed end of a pair of scissors. Cut the top off of the can by inserting the scissors blade into the hole and cutting around the can. You may want to do this step if your child is young. Be careful not to crush the can when removing the top. Discard the top. Cut off 2 1/2 inches from the bottom of the second can using the scissors, and put it aside. You will use the excess aluminum piece later. Repeat steps 1 and 2 to cut the top and bottom off the third soda can. Now, using the scissors, cut the body of the third soda can in half so it lies flat. Draw a 3-inch-long airplane propeller on the flattened piece of can using a permanent marker. Draw two airplane wings on another part of the flattened aluminum. The wings should be the same size and shape. Cut along the propeller shape carefully to avoid being cut by the sharp aluminum. Cut out the airplane wings. 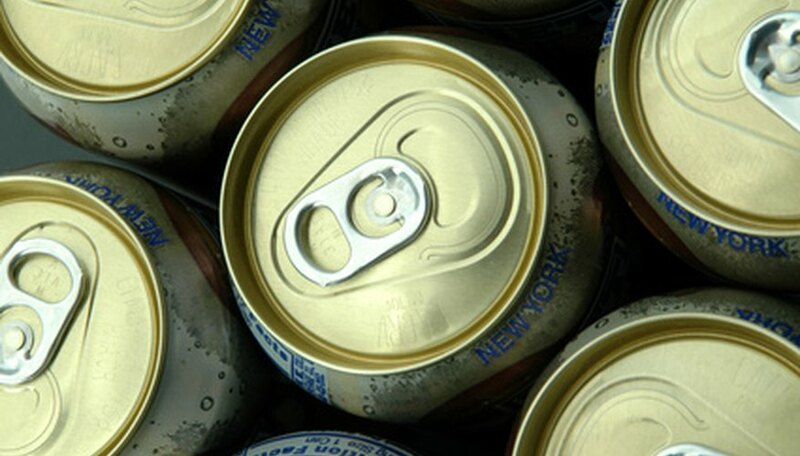 Take the first soda can and make two thin cuts in the middle using a craft knife. As in step 1, if you have young children, you or another adult should do this step. Make sure that the cuts are approximately the width of the airplane wings. At the bottom of the can, make a horizontal cut, slide each wing through the cuts, and secure them with glue. Take the excess flattened aluminum can and draw the tail of the plane. Cut it out with a pair of sharp scissors, slide it through the cut you made on the back of the can and glue it. Punch a hole through the bottom center of the excess aluminum can from step 2 by placing it on a block of wood and using a hammer and nail to punch through. Now, poke a hole in the center of the airplane propeller. Attach the propeller to the bottom of the can with the hole using the screwdriver, screw and nut. Be careful not to over tighten the nut, so the propeller will turn. Attach the piece with the propeller to the piece with the tail by sliding them together and securing them with glue. You may choose to paint the model airplane to cover the logo of the soda can. Aluminum is thin and sharp; children should be monitored by an adult when crafting the airplane. Since 2007, Jophiel Aurora has written articles on environmental issues, vegetarianism, travel and animal rights for Web sites like eHow, Answerbag and LIVESTRONG.COM. Aurora is also a writer for Animal World: Our Co-Inhabitants, an online program. She has a Bachelor of Business Administration in computer information systems from Georgia State University.